Appreciate the commentary Kalaeb and O-Onion. Agreed on the light coat of oil. I'd say that would be my number one recommendation to anyone new to these skillets. Light means light otherwise you end up with a gooey mess after seasoning. My little ~7" has been giving me fits recently with sunny side up eggs with ghee as my fat since reseasoning it a few weeks ago. I've tried varying amounts of fat and different heat levels all with similar results. The big boy is a champ for searing. No plans to ditch them or mess with the seasoning, but I'm close to adding a little throwaway teflon skillet just for that use case as I make them most mornings. Like Kalaeb I'm also a believer in simply using them. The only reason I stripped the first one again was I had convinced myself there was a decent chance I never got all the wax off initially. I have two Matfers and am happy with them, but will likely try a different brand next time just to see. On the subject of the Shibata pan I'm wondering if the different thicknesses of the walls vs. bottom is to save some weight overall while using a thicker chunk on the bottom for more even heat distribution. Now I could see additional value in that vs. all 3mm or all 1mm for example. Looking forward to Maui's review. Oh sure,cover up the entire bottom of your pan so we can't see your lousy seasoning job. Debuyer on the left, Newquist on the right. In the beginning I tried everything to get that cool black mirror seasoning. Lard, flax, grapeseed etc...- I tried doing it in the oven @500, over a natural flame. The flax seasoning took the best and gave the best appearance (whatever that means), but after a few uses it just started flaking off ( I have a bunch of flax oil that I will never use, if anyone wants it let me know and I will send it to you). I have scoured the debuyer down to bare metal three times and always took it back up to a 1k polish...no easy job. 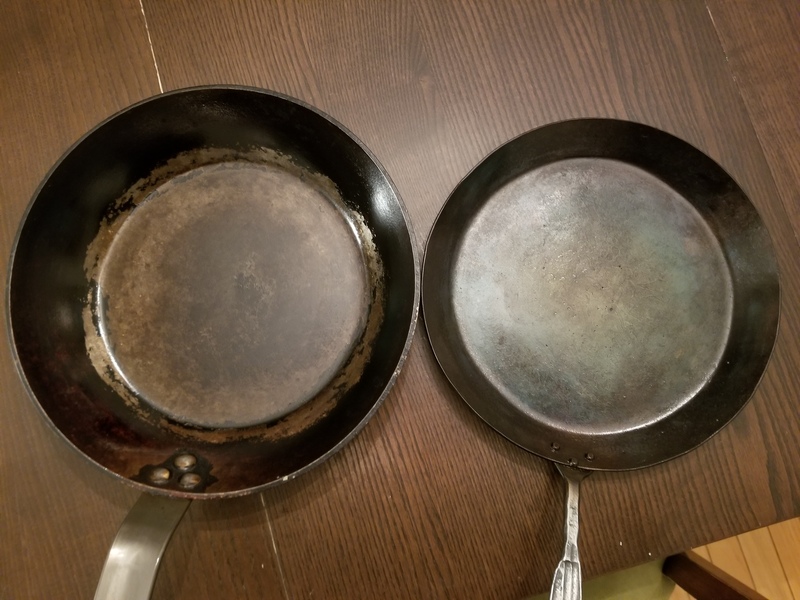 I was so sick of stripping the pan I almost vowed to never use carbon again. I gave it one more shot and just used it, dealing with a little sticking early on. After each use I wipe down with a little canola oil. If I burn something in the bottom I will scour it with some rock salt. This is about a year of use. The Newquist on the right usually only gets used for things like crepes, pancakes, grilled cheese and eggs. The Debuyer usually takes all the proteins and higher temperature searing. I can say with confidence, flax seed works great on cast iron. I have also seen Posting on woodworking forums that it makes for a food safe finish. “Boiled linseed oil” is flaxseed oil with additives that aid in curing. I would tell you to send it to me, but I am not sure the cost of shipping is worth it. You've revealed your humanity Kaleab, thank you. That being said, I still like the preseason. It just needs the right method. That stovetop method I did is phenomenal. I saw a video of one very similiar where it looks like the guy dry heats and then puts thin coat of oil that might be even better. The newquist forge pan comes ready to rock, and it's preseasoned. So I got my field#10 in and made a batch of caramelized onions then a batch of mirepox. This thing is awesome!! just trying to get a lodge to the point this came out of the box is painful. Of course, as soon as I use it they post the new #12. So no I need the 12. Maui did it already, n'est pas? *NOTE: Initial use require I) more oil II) some patience, and III) it is recommended to start out with proteins. Any extra steps to color your pan red, black or brown using the oil of your choice should be done I) with a single drop of oil, spread very thin, and II) recommended for exterior aesthetics. Don't waste your time on the interior. The exterior of my Min-B is quite nice from the flaxseed. The interior, as others noted, has just stripped away (and good riddance!). Regular use has brought the pan to the condition many of you have described - quite nonstick (when food is crusted), and easy maintenance, just wipe clean. Was in my local kitchen supply store yesterday, and they just got these new pans in. Described by a sales rep as "thin cast iron", they were thinner than carbon steel pans, but still some weight. The website calls them "spun iron". Still looking into these but I'm tempted to give them a rip. The company also makes gorgeous flippers and trivets. It’s a nice thought but I don’t think you’ll ever get consensus on this one haha. I skipped potato peels and used a lot of oil but didn’t let it smoke too long and it worked perfectly (basically your step 3 but without potatoes), just like in the debuyer instructions. I watched a few YouTube videos where people are seasoning carbon pans and the comments sections are full of people arguing about this topic. It’s a touchy one it seems! Last edited by Bluenoser87 on Thu Dec 06, 2018 3:41 pm, edited 1 time in total. Nah, you won't see me getting upset by the discuss, but I'm not blindly accepting this route either. My pan is pretty much brand new and egg are sliding around nearing Teflon status and only using small amount of fat. There is nothing wrong with the route you described, but there's nothing biblicall about it being the way either. If people want to take long road like grandma, nothing wrong with it, but I rather my pan ready to rock from the start. Also already cooked burgers with no issues at all. Proteins - fish, steak, eggs etc. Bring it! The point is to save some folks time. Those look interesting after visiting their website. Looks like 12" frying pan only weighs about 3.65 lbs while my matfer comes in at 4.6 lbs. The cost is about 80 bucks, but another 43 for them to ship it to california. This was exactly what I thought Brad, and why I elected to spring for it..that and the obvious artisanship and beautiful aesthetic that has been put into it by one of my favorite blacksmiths. I will reveal all soon. Ya, shipping from England is rough. If you or anyone else want to look into what shipping would cost from Winnipeg, I'd be happy to send from here. Of course, retail prices might differ but with the exchange rate from CAD to USD, don't think it would be that bad. Did you get it seasoned Blue, or are you still having trouble? Field skillets just came out with their number 12, could help it, had to have it. I have one headed my way, their skillets are above and beyond.